Safari® is the leading drench/spray insecticide in the market for good reason: performance. Safari controls more insects faster and longer than any comparable insecticide. It provides excellent control of Q-biotype and B-biotype whiteflies, aphids, fungus gnat larvae, leafhoppers, leafminers, mealybugs, armored scales and soft scales. 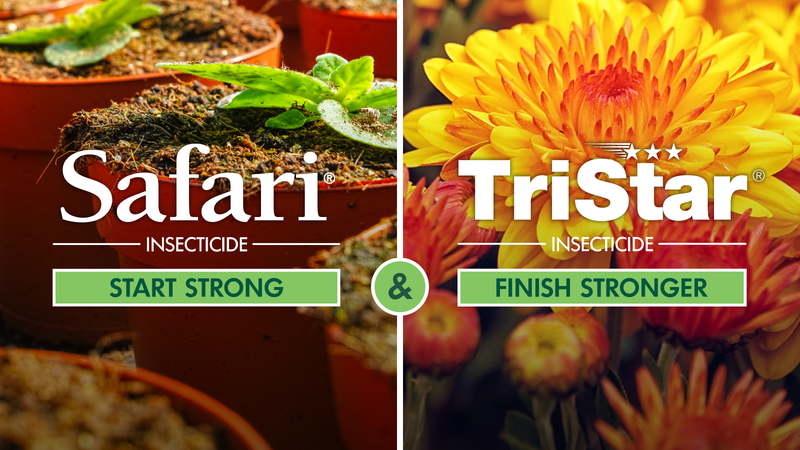 TriStar® is the leading midway-to-finish spray insecticide for good reason: assurance. With broad-spectrum control, quick knockdown, little residue, and “just-right” residual, TriStar protects plants for a stronger finish. TriStar is softer on beneficial insects and an alternative where pollinator impact is a concern. View the Bloom Brilliance – Safari and TriStar Insecticide brochure (PDF) for helpful performance information and competitive trial data. Trademarks of Nufarm Limited or an affiliated company of Nufarm Limited.